November 17 is a national holiday in Slovakia called Nezna Revolucia, which commemorates the student-initiated protests (the Velvet Revolution) that ultimately brought down Czechoslovakia's Communist regime over 20 years ago. It's a big deal - the kind of holiday where people go back home to spend a few days with family, eat lots of food, and drink copious amounts of booze. On Thursday morning, we took the train to visit Terezia's parents in Podrecany. In what I'm told is typical Slovak fashion, many trains were overbooked, which resulted in people literally having to cram themselves into the train cars like sardines. Trains to Kosice were particularly problematic. Luckily, we booked tickets the day before and paid a little extra to reserve seats. There were, however, people in the corridor of our train, who, having to stand for a few hours until their destination, decided to turn the ride into a party and got snockered on Becherovka and beer. In fact, when we got out of our cabin to get off the train, the whole car reeked of booze. 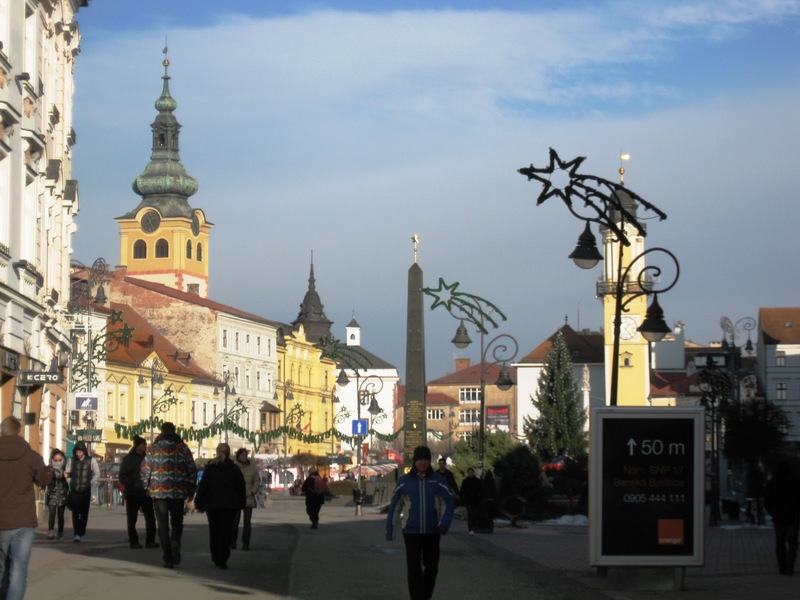 At any rate, on Friday we took a short trip to Banska Bystrica, a charming town right smack in the middle of Slovakia, which is the capital city of the region of Slovakia where Terezia grew up. The reason for going here was to re-establish Terezia's Slovak residency, which could only be done in the region in which she was last a resident. 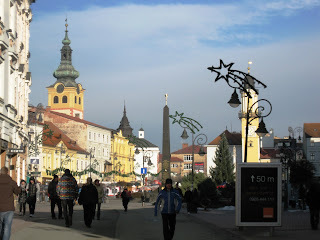 Banska Bystrica's groovy historical center - this photo was actually taken last year around Xmas time. 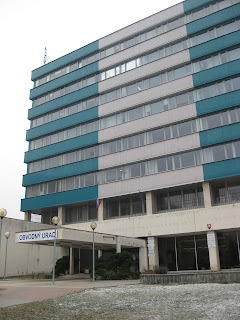 We had to go to the charming Communist-era monstrosity known as the Obvodny Urad. The woman Terezia dealt with there seemed very stern, but luckily everything was in order, so that's one more thing we can check off the list. Now she can establish her current, permanent residency in Bernolakovo at her brother's home address. We spent the weekend hanging out with family, drinking, eating, cooking, lounging around, etc. We had a little family shindig Saturday night with Terezia's uncle and aunt (who live just down the street from Terezia's parents) and cousins, for which Terezia prepared some amazingly tender and sublimely flavorful pork ribs. On Sunday we had a nice drive back to Bratislava with Terezia's cousin Ludka and her German boyfriend Chris. The freeway between Bratislava and Zvolen is finally complete, which shortens the drive to/from Terezia's parents down to about 2.5 hours (it used to take over 3). Chris drives lightning fast - in typical German fashion - which made the drive even shorter. Chris has been living in Bratislava with Ludka for less than a year, so like me he's a stranger in a strange land (albeit much closer to his native home), and it was fun to chat with him about impressions of Slovakia. We all agreed that customer service in Slovakia is often appalling. At any rate, this coming week, there'll be a whirlwind of bureaucracy and we'll be checking out some more apartments. And by the way, it's freaking COLD here right now! The temperature hovers around 0 degrees Fahrenheit these days, which is about as warm as it gets!